$25 for $50 Worth of Elephants on the Wall Paint-by-Number Wall Murals! Elephants on the Wall specializes in unique paint by number wall murals. They're super easy to use too: just tape, trace and paint! Each kit includes a full sized paper pattern, an equal amount of transfer paper, directions, and a color guide which you can choose to follow or you can pick colors that you feel better match your decor. There are over 200 different murals to choose from on their website (you can see them all here). 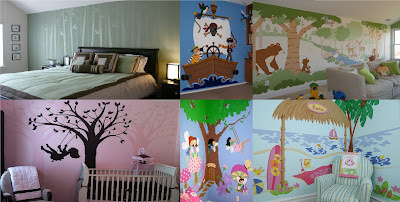 These murals can be painted on textured walls, can be reused, reversed and repeated as many times as you like!